Rays and sharks are seen by some people simply as oceanic monsters. They are instead some of the most important predators in the food web of coastal waters. 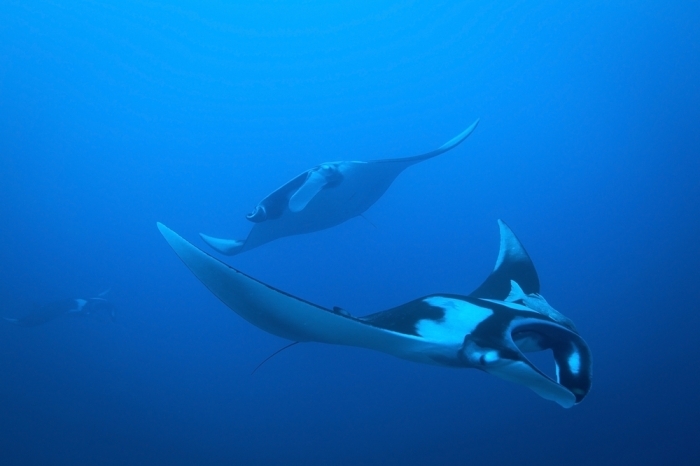 The peaceful manta ray, also sometimes known as devilfish, (Manta birostris) has had fast cars named after it and measures a magnificent 7.6m (25 feet) across with a length almost matching that. This species of ray has a very large mouth at the front of the body, while others have the mouth lower, under the chin. 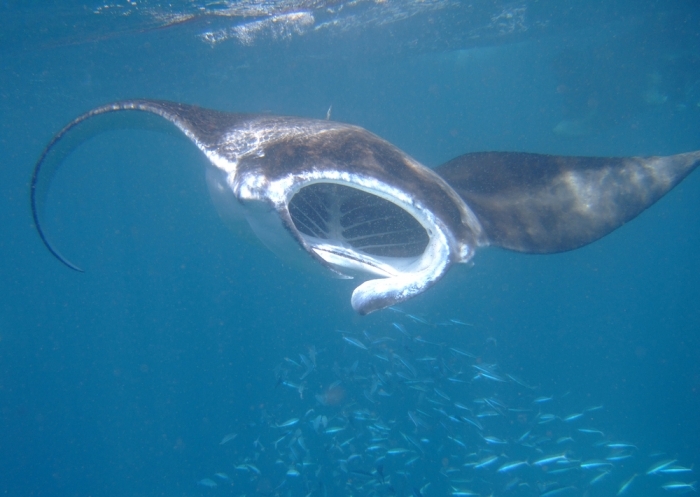 The mass is 2400kg (or 5300 pounds), gained from a diet, like other large marines, of bottom living plankton and small fish filtered through its 18 rows of gill rakers. They also skim the water surface, presumably when plankton accumulates there. Like the dolphins, these animals can display, jumping out of the water, with a contrasting white belly and black or brown dorsal surface. They dive to at least 500m and cover most of the oceans with their migrations. Their "sting" has lost its function, unlike the sting ray, so divers find them among the most amazing and friendly company in the ocean, as they "fly" through the water. The actual tail is short compared to some rays. Their skin denticles are smoother to touch,, if you are lucky enough to approach the manta, unlike the "sandpaper" of sharks. They are eaten by faster predators such as the orca and large sharks. Reproduction, like several other sharks , is viviparous, although the egg simply develops inside the female with no connection. After this false gestation of twelve months, the most likely birth is of twin pups! Threats to the largest ray include Chinese fake medicines, based on the spongy gill rakers. Fishing has decreased populations by up to 80%, but in 2011, its full protection in international waters was finally assured. IUCN declare it as having "an elevated risk of extinction". Threats from certain fishermen and fishing methods still continue. If you want to see one, aquaria are generally much too small. You may have to visit a suitable coral reef. For example, the Australian populations have been observed migrating all the way around the south east of the continent.